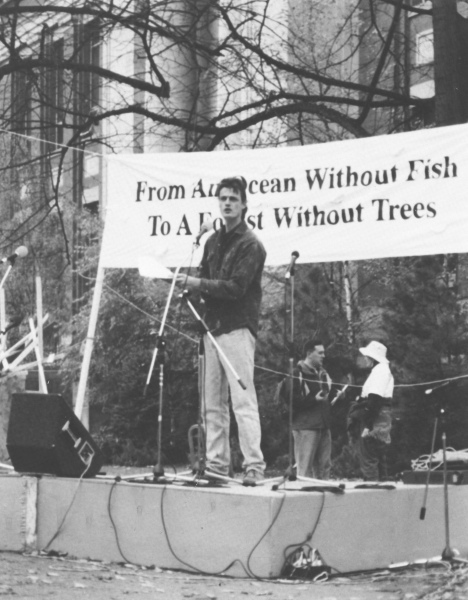 K’JIPUKTUK (HALIFAX) – After 23 years in the job, Mark Butler, Policy Director at the Ecology Action Centre (EAC), will be leaving the organization. Butler joined the EAC in 1996, as Marine Coordinator. “When I started, it was me, a part-time office manager, an apple computer and fax machine, and a group of dedicated volunteers,” Butler says. Today, the grassroots organization has grown to more than 40 staff, 5000 members, 300 volunteers and its own green building. Butler has supported or lead the charge on some of Nova Scotia’s major environmental milestones. This includes the designation of Sable Island as a national park, the creation of a provincial energy efficiency agency, the protection of close to 13 per cent of land in Nova Scotia, and the unanimous approval by council of the Green Network Plan, a major milestone toward making Halifax a national leader when it comes to protecting nature from development. “Twenty-three years is an astounding length of time to spend with one organization. I did so, because every day, I knew we were making a difference,” Butler says. And while Butler has stewarded many accomplishments at the organization during his tenure, he says he is particularly proud of helping to build a strong organization and contributing to a growing movement. “The environmental movement across Nova Scotia and Canada is growing. It’s become more diverse, and ultimately, more powerful. This gives me hope. It should make everyone hopeful,” Butler says. Butler will finish his role in October. He plans to take some time to spend with his children and family and get out into nature, before jumping into the next adventure. But he has one major goal before he leaves - action on plastics. “We need to see action from all levels of government. It’s been encouraging to see the municipalities lead the way, it’s time for our province to commit to a province-wide bag ban and EPR, and for our federal government to implement a zero plastic waste strategy,” Butler says.